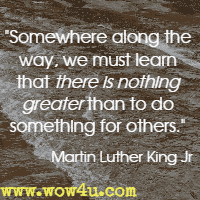 By helping others we are making this world a better place. 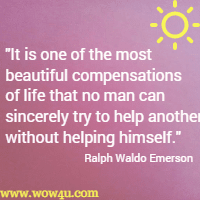 Let these quotes about helping others encourage you to assist and support others whenever you can. 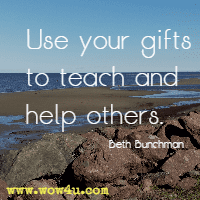 O ften don't want to ask for help. 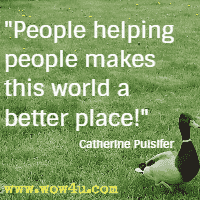 P eople helping people makes this world a better place!" 24. 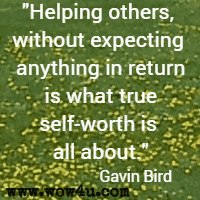 "Helping others, without expecting anything in return is what true self-worth is all about." Gavin Bird, Self Esteem: Change your life in one day! 31. I hear him (Martin Luther King Jr) preaching at his Ebenezer Church in Atlanta: "I choose to identify with the underprivileged. I choose to identify with the poor. 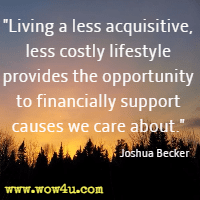 I choose to give my life for the hungry…. This is the way I'm going. If it means suffering a little bit, I'm going that way. If it means sacrificing, I'm going that way. 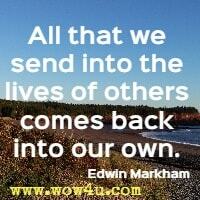 If it means dying for them, I'm going that way, because I heard a voice say, 'Do something for others.'" Vincent Harding, Where Do We Go from Here: Chaos or Community?